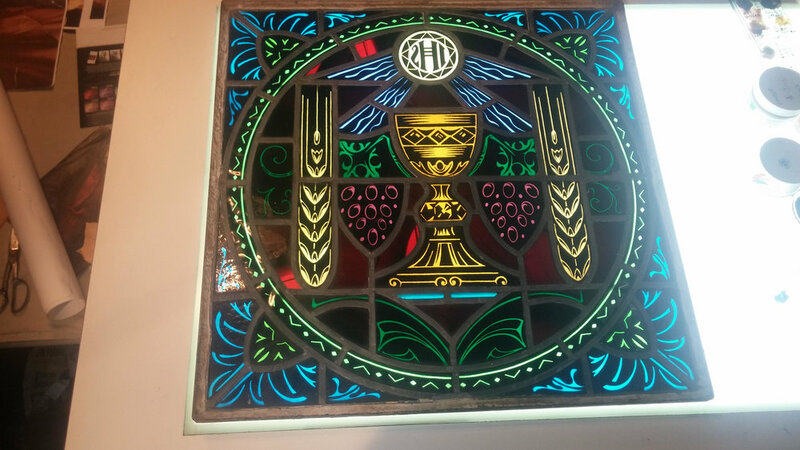 The 18 ft by 5 ft stained glass window commissioned by St. Thomas the Apostle Catholic Church has been completed and installed. Steve has developed a new process that incorporates old and new technologies to create this astounding work. The image depicted is of St. Thomas being invited by Christ to allay his doubts that He has risen by touching His wounds. The stained glass process is a tedious but rewarding one. The faces and hands, for instance, are "painted" on clear glass with ground glass powder that must be mixed with a liquid medium to apply. When the image is painted, the glass is then fired at intensely high temperatures in a kiln. The kiln takes 2-3 hours to heat up to the correct temperature. Then the wait begins for the kiln to cool. This takes place over 10 plus hours. When the kiln is cool enough to be opened, the glass is removed. If the medium mixed was too thin, the image will be burnt off. If the medium mixed was too thick, the painted areas will flake off in chunks. If either of these events happens, the process begins anew and the images need to be completely repainted. Colored glass has to be selected, cut, painted (i.e. shadows on folds). And then installed in metal frames. When the pieces have been assembled, the window has to be installed in its permanent location. This involves the use of hydrolic lifts and a myriad of tools and mostly patience. Steve has developed a process for stained glass that utilizes newer technology, but still maintains the beauty of this medium. A new project is underway. Look for posts documenting this exciting process as it unfolds. Here is a current image of the portrait of St. Benedict incorporating the landscape of Young, AZ as requested by the parishioners of St. Benedict Mission. Original version of St. Benedict Painting with gold background. of Young as opposed to the gold background. We are now working on adding that imagery.